Producers: Dave Stewart, Stephen Lironi, Jon Bon Jovi, Desmond Child, Eric Bazilian. 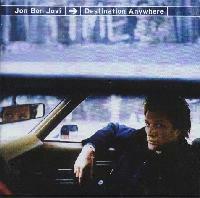 Album Notes: Personnel: Jon Bon Jovi (vocals, acoustic & electric guitar, harmonica, piano); Lance Quinn, Eric Bazilian, Dave Stewart, Aldo Nova (guitar); Steve Lironi (acoustic & electric guitar, keyboards, synthesizer, programming, loops); Bobby Bandiera (electric & slide guitar); Kurt Johnston (dobro); David Bryan (accordion, piano); Desmond Child (tuba); Guy Davis (piano, Hammond B-3 organ); Rob Hyman (Wurlitzer piano); Jerry Cohen (organ, keyboards); Terry Disley, Imogen Heap (keyboards); Alex Silva (keyboards, programming); Hugh McDonald (bass); Kenny Aronoff (drums); Andy Wright, Paul Taylor (programming); Maxayne Lewis, Alexandra Brown, Zhana Saunders, Brigitte Bryant, Mark Hudson, Dean Fasano, Mardette Lynch, Helena Christensen (background vocals). Give Us More of This Jon. A review by Dawn G.
Time to go solo for the 2nd time!